Painting on glass windows is difficult if the windows are already fixed in the frames, because the colors trickle down on vertical surfaces. To overcome this, "Glass Painting Window Art" comes in handy. 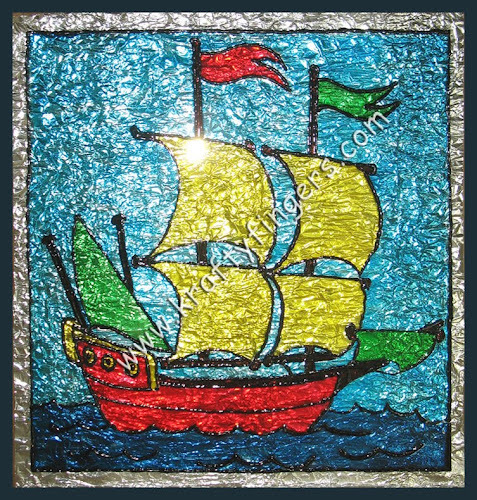 To put simply, "window art" is glass painting done on transparency sheets and then pasted on windows. It not only adds that extra zing to your home décor, but also diffuses strong direct sunlight. Plus, it is non-permanent. So if you get bored with a certain design, you can remove it anytime and put up something new. 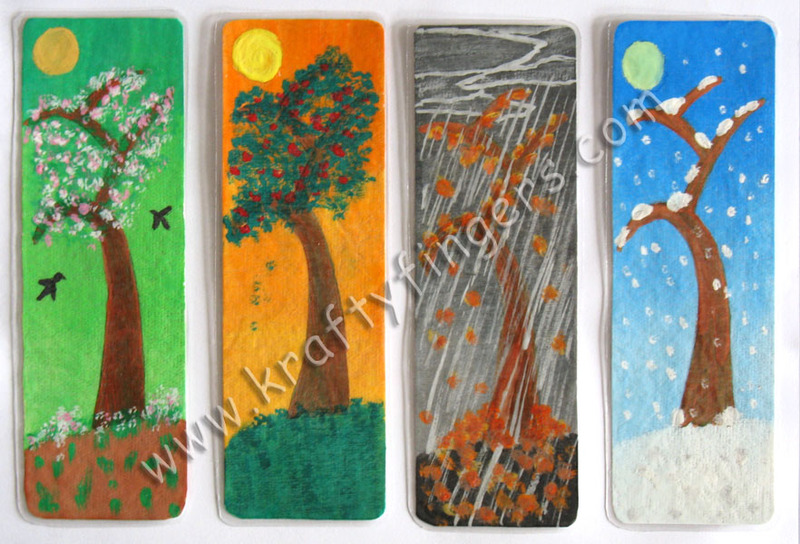 Here's a short tutorial explaining the entire process of making glass painting window art. First of all, you will need OHP (Over Head Projector) Paper or transparency sheets. You can get them in size A4 in most stationery stores. Bigger sizes are not so easily available though (at least in India). Then you will need glass liners and glass colors (solvent-based or water-based, doesn't matter) and some sticky dots or glue dots or invisible/magic tape (whichever is available easily). Invisible/magic tapes are non-permanent double-sided adhesive tapes. Print your design on a sheet of paper, put the paper below the OHP sheet, trace the design using the glass liner, allow to dry and then fill in the colors like you would on normal glass. Once the colors have dried, stick the OHP sheet on the window using the sticky dots / magic tape. After "Fiery Sunset" and "Snowy Alpines", here's yet another best-out-of-waste project, inspired by one of my favorite landscapes - the tropical sand-and-surf kind of look! 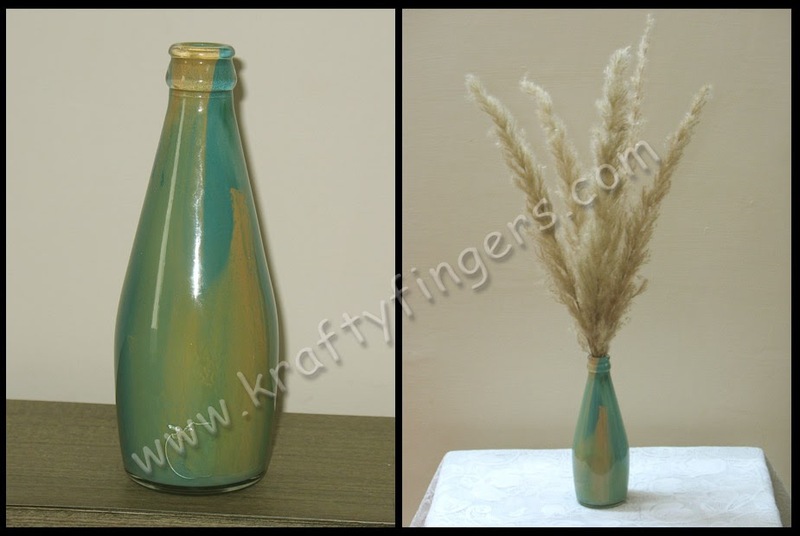 For this vase also, I started with the lighter shade of enamel paint first - the sand colored paint. It was actually the excess paint collected after doing the "Halloweend In Peach" jar. 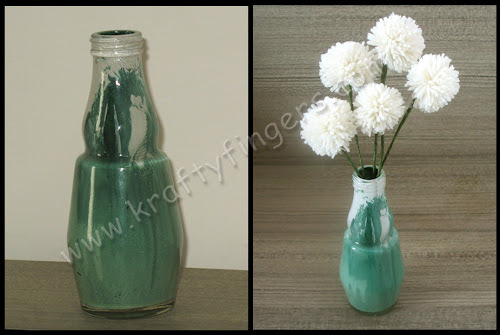 And the turquoise blue of the surf was obtained by mixing in a little blue with the pastel green left behind after finishing the "Snowy Alpines" bottle. I used some dried fern from the neighborhood to turn this recycled glass jar into an attractive center-piece for a corner table. Who said home décor had to be expensive? This "Sand and Surf" center-piece is a part of the "Limited Edition Collection" here. Please order immediately if you are interested in this product. This recycling and flower making project was inspired by the fiery sunsets visible from my 7th floor balcony. Landscape designs, featuring sunsets, always catch my eye. I find those varying shades of yellow and red absolutely stunning! And those are the two shades of enamel paints I used to make this vase. The other intermediate shades happened on their accord, as the colors mixed randomly inside the bottle. I decorated this recycled glass jar with some of my handmade flowers, so it could be used in home décor. The red and yellow roses are made of satin ribbons, and the stem is of aluminum wire, covered with green self-adhesive tape. This "Fiery Sunset" best-out-of-waste project is a part of the "Limited Edition Collection" here. Please order immediately if you are interested in this product. This indoor potted plant was set in a recycled glass jar from my kitchen. I've always been in the habit of using those empty jars and bottles for storing spices, pulses, juices and other similar stuff. This time, I decided to try something different. I bought small cans of a few shades of enamel paints from my local hardware store, and then set about painting a batch of random old glass jars and bottles, in different colors. 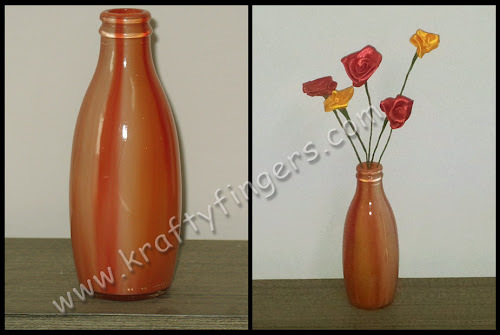 This particular jar was made as a giveaway for the readers of my personal blog, to celebrate my 600th post on that blog. My blog buddies there know me as 'Kaddu', which is the Hindi word for 'pumpkin', and they associate me with the grinning 'Halloween pumpkin' face. So I decided to paint this jar in my official 'blog avatar' pattern. 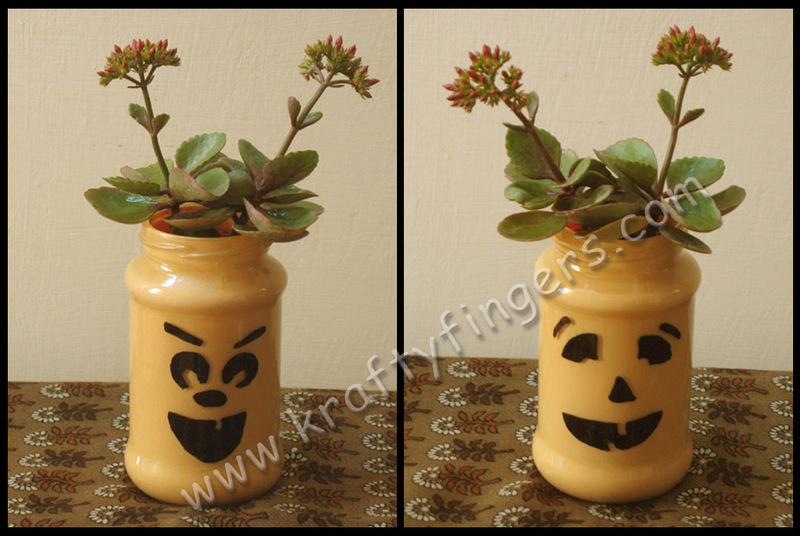 I put some soil in it and set a couple of small indoor flowering plants in the jar, to be used as home décor. 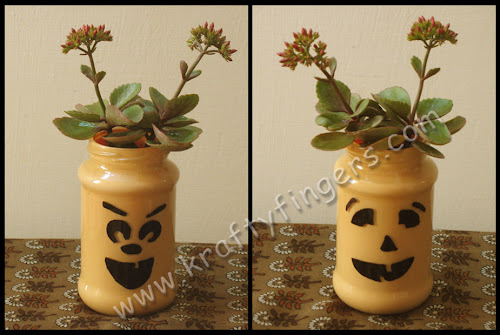 But it can also be used to hand over Halloween treats to kids, and they can later use it as a pen holder, or a vase. This "Halloweend In Peach" best-out-of-waste project is a part of the "Made-To-Order Collection" here. I have a strong weakness for landscape scenes featuring water or sunsets. 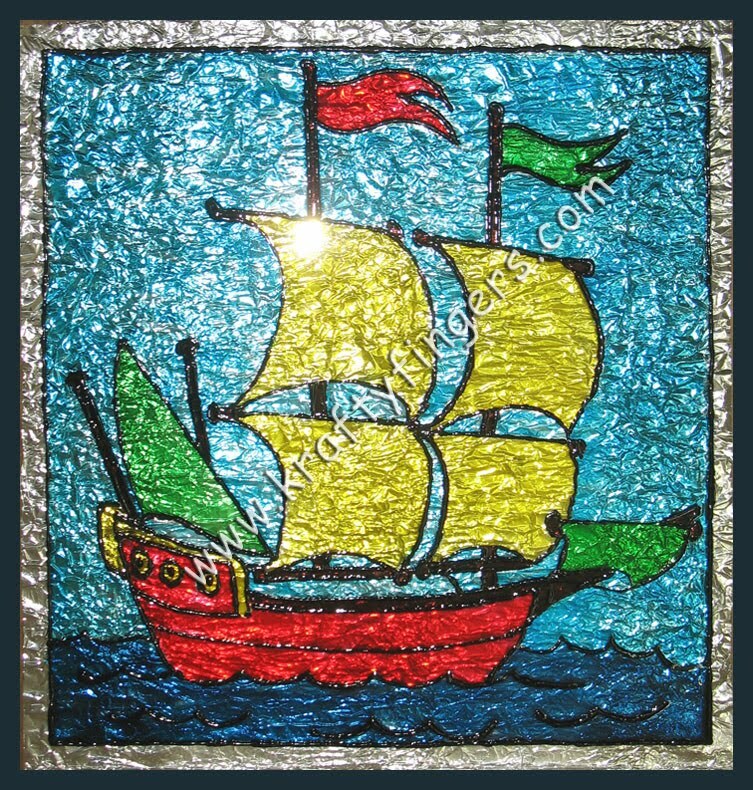 I saw this design in a kids' coloring book and it reminded me of that old nursery rhyme - "I Saw a Ship A-Sailing"! LOL! Decided to try it out as a glass painting. I have used crumpled silver foil as background for this painting. A light bulb in the room is creating that effect of the mid-day sun on one of the sails. This Wall Art painting can be custom-sized on order. The size can be scaled up or down in the same proportion. 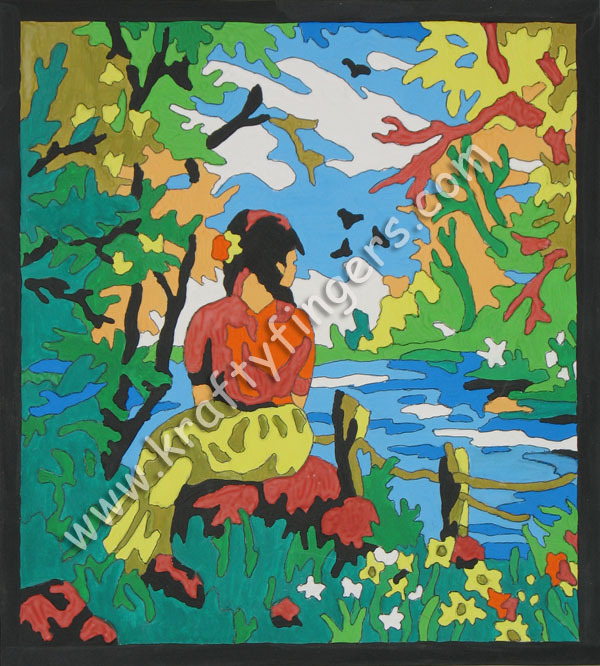 This landscape design, featuring the young girl, lost in her thoughts, was previously done in hand embroidery. It was posted here as "Still Water: Embroidery". I liked this scene so much that I decided to adapt it as a Water Painting on art paper, slightly larger than the original embroidered version. One of these days, I think I might even attempt it with oil paints on canvas! The shading work looks so much better with oil paints than with water colors, don't you think? This "Solitude" hand-painted Wall Art is a part of the "Made-To-Order Collection" here. It was made as a giveaway for the readers of my personal blog, to celebrate my 600th post on that blog. But you can contact me if you'd like to place an order for this product. I will be happy to make it for you. The Indian festival of Rakshabandhan is just around the corner. 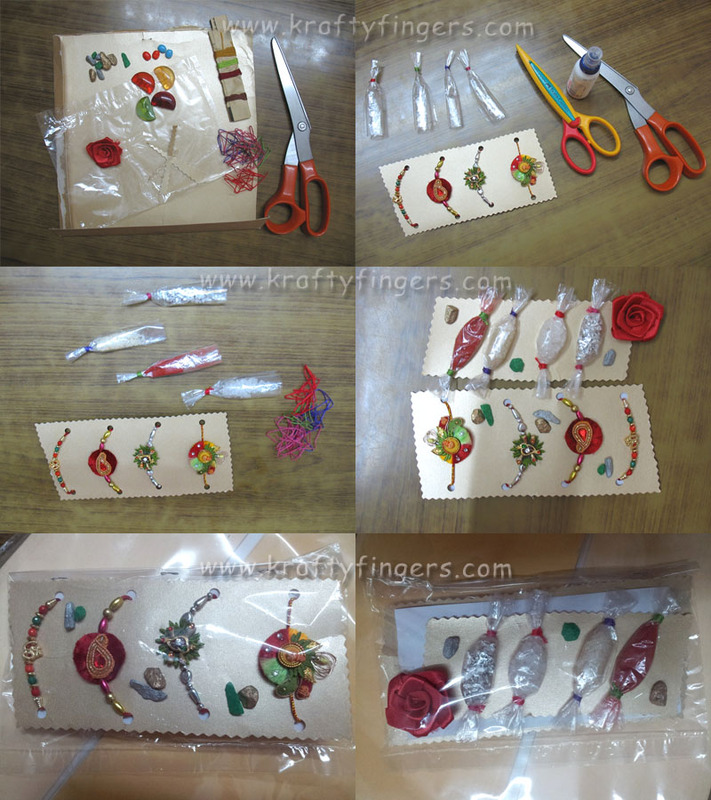 As always, I had to send Rakhi to my cousins in Guwahati, but this year, I decided to do it a bit differently. In stead of just buying the Rakhis from the market & dumping them in an envelope to post, I decided to do a bit of decorative packing. I cut two rectangular strips from blank areas of the invitation card and trimmed their edges with a zig-zag scissors. In the last two pictures, you can see the two cards one behind the other, placed in the bottom half of the plastic packet. Wrapping up the stuff in plastic is always advisable during the monsoons here. It didn't take too long to do the packing, and no extra cost was involved, as it was all done by recycling old stuff. Yet, it added that extra touch. I recently tried this new technique of flower making. These beautiful candy-colored Dahlias have been made with paper napkins, and they are currently decorating my bedroom, but they will look absolutely amazing as Party Décor for baby showers, birthdays of little girls, and in wedding anniversary celebrations. They can be used for both indoor and outdoor décor. They are fairly easy to make, though they DO require a bit of patience. 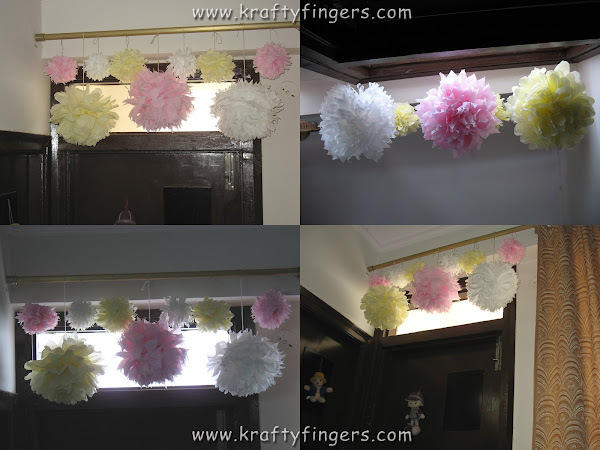 If you'd like to make them for decorating your kid's room or for a party, you can follow this simple tutorial below. I used 30cm by 30cm double-ply paper napkins for these flowers. But you can use single-ply napkins too, or even tissue paper (available at most craft supplies' stores) cut into the desired size. The finished flower will be of approximately the same width as the size of your paper. You will need yarn, scissors and paper napkins. For a big Dahlia, take 6 double-ply napkins or 10 single-ply napkins. For a small Dahlia, cut 2 double-ply or 3 single-ply napkins into quarters, giving 8 or 12 pieces respectively. 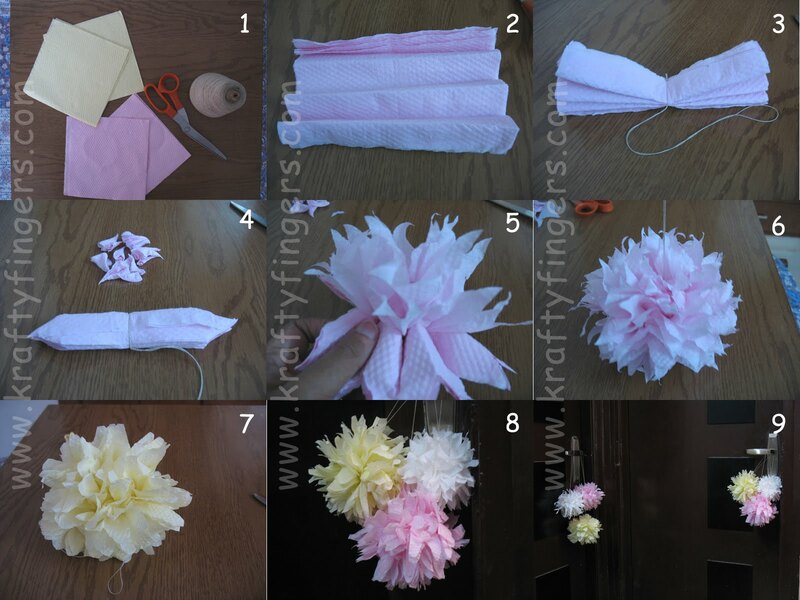 Layer the napkins one over the other, and then fold into accordion folds (about 3 cm width for big flowers and 1.5 cm for the smaller ones). Tie a thread in the center of the folded bunch to hold it tightly together. Leave an extra bit of string at one end for hanging the flowers once they are finished. Cut the ends of the folded strip to give a shape to your petals. I tried a "U" shape for the big yellow flower, "V" for the big pink one, and a forked look for the big white flower. Now comes the tricky part. You need to separate all these layers of paper into the shape of a Dahlia. If you're using double-ply napkins, you'll need to separate the individual plies. This is where you need a mountain of patience, because if you try to rush through this step, you'll end up tearing the sheets. If you manage to complete the above step carefully enough, this is what you should get in the end. Pictures 7, 8 and 9 are just to show you the finished small flowers. It's best to hang them somewhere as you finish them. The petals become a bit tussled if you leave them on the bed or floor. Variation: I hung these handmade flowers individually, on a spare curtain rod in my bedroom. But you can also make a full-length curtain out of them. In Step 3, when you tie the string, leave it hanging out on both ends. Then you can use these extra bits of string to connect the flowers to each other in a chain. A family of red-whiskered Bulbuls, perched high up in the tree, surrounded by green leaves and pretty pink flowers. This birds design was already printed on the stiff porous canvas. (I don't know the exact name of that material!) 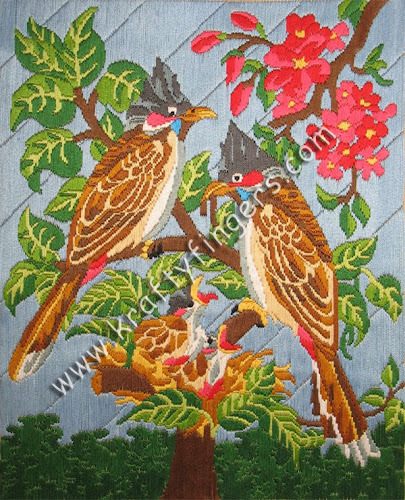 The entire piece has been done in hand embroidery, using the long & short stitch in a single vertical direction. This was yet another intricate design with various cooling shades of blue and green. And the pink flowers added that little bit of extra color. I completely enjoyed embroidering this piece. Detailed designs like this take time to complete, but the end result is totally worth it, isn't it? 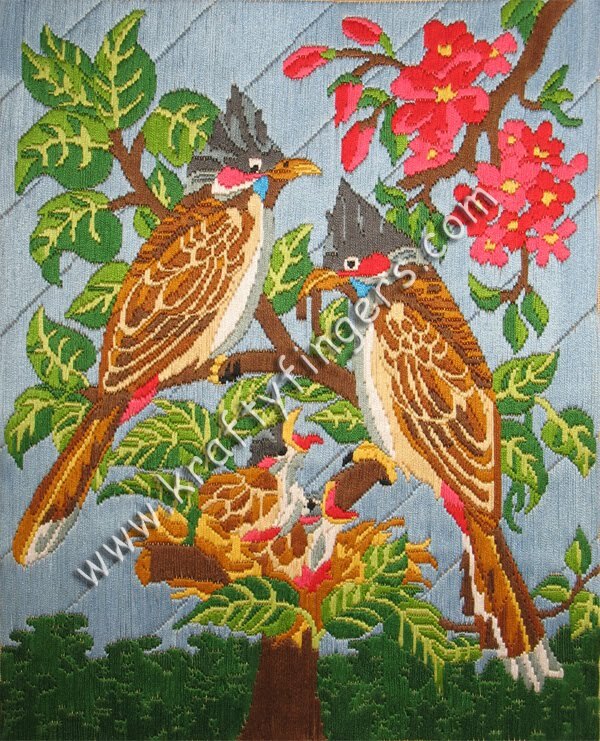 This "Bulbul Birds" embroidered Wall Art is a part of the "Limited Edition Collection" here. Please order immediately if you are interested in this product. 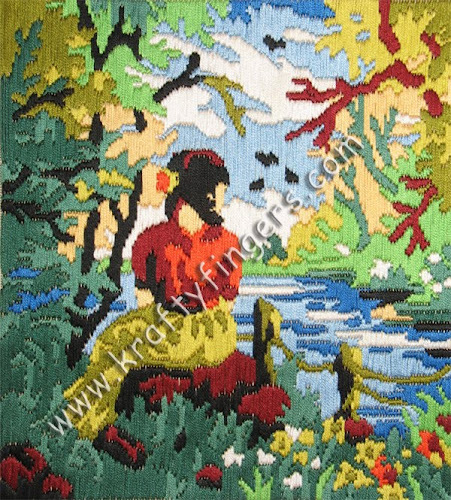 Eligible for super savings under Special Offer - "MORE-N-MERRY"
A beautiful scene done in hand embroidery, showing a young girl, lost in her thoughts, sitting by the waterside, staring into the calm blue waters, amidst the lush green foliage. This landscape design was already printed on the stiff porous canvas. (I'm afraid I don't know exactly what fabric it was!) The entire piece has been made using the long & short stitch in a single vertical direction. I've always liked embroidering designs having people. And I especially liked this design because of its colors. The various shades of blue and green lend an air of tranquility to the scene. They also give a feeling of coolness on a hot summer day. I would so love to be this girl after a long day's work! This "Still Water" embroidered Wall Art is a part of the "Limited Edition Collection" here. Please order immediately if you are interested in this product.